CE Credits: 8-10 hours required. Meets requirements for Washington State law. 8 CEs awarded. This course is for those on the “front lines” of suicide prevention: crisis volunteers and professionals, 911 and 211 operators, I&R workers, clergy, school counselors, case managers, occupational therapists, health care workers or anyone who is likely to come into first contact with someone who may be suicidal. Often times this first contact may be in a clinical care or first responder setting. A customized version of this course is available for law enforcement, EMS/firefighters, nurses and primary care physicians and physician assistants (please course listings). This interactive course teaches you how to detect and interview people in crisis, how to determine if they are suicidal, how to assess immediate risk of suicide, as well as how to immediately reduce the risk of a suicide attempt or completion through a safety planning and referral process. We will teach you what to say, what questions to ask, what the answers to your questions mean and how these answers will help determine risk and next steps to ensure the person’s safety. The training will also be helpful in working with people in text over the internet. This online training program cannot cover all the relevant things you need to know, but through our consultations with hundreds of professionals and their input, we have a pretty good idea of some helpful things we can teach you and that you should find of value. A complimentary 1st Responder Training manual to supplement this online training program with a classroom post-training experience is available on request. As background to building this course, you should know that what we will teach you is also taught to mental health professionals, nurses, law enforcement professionals, and many others who are in the front ranks of health care and suicide prevention work. Course time required: 8 to 10 hours, depending on reading speed and how much time the student explores web links and practices the intervention. Many people taking this course have a high degree of line-of-duty exposure to suicidal behaviors, both in the pre-attempt phase (when suicidal persons are communicating intent and desire to attempt suicide via suicide warning signs), and after a suicide attempt or completion. For some learners, this course is a "next step" up from basic QPR Gatekeeper Training for Suicide Prevention (included in this program if the learner has not already taken basic QPR training). For those who have already taken basic QPR training, the online module offered here will provide a good review. Compared to basic QPR, this course is much more extensive in terms content, research, and understanding suicidal behavior, and teaches you how to assess acute risk and conduct what may be a life-saving intervention. 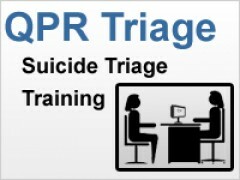 To earn the QPR Suicide Triage Certificate the learner must complete all modules and pass all quizzes. Of note, the QPR Institute trains and licenses Certified QPR Instructors for those interested in teaching basic QPR face-to-face, and we also train and certify people to teach this course face-to-face (about 40 hours of training). If certified as an instructor for QPR Institute courses, you will be authorized to teach this program and issue certificates to those you train. As of this writing in the Spring of 2011, the Institute has trained more than 10,000 Certified Gatekeeper Instructors who have, in turn, trained more than one million gatekeepers worldwide. In addition, thousands of clinical health care providers have been trained in how to detect, assess, and manage suicidal consumers. If this sounds like an "army" of people helping to prevent suicide, it is. Now, with your help, we will create a new division in that army of people trained to help prevent suicide. We believe that crisis volunteers, first responders, 911 and 211 professionals, case managers, emergency services professionals, corrections professionals as well as many others in frequent contact with at risk populations need to know as much about suicidal behaviors and how to intervene to reduce risk and enhance safety as do trained mental health professionals. This training program teaches initial and basic suicide risk assessment skills. Advanced suicide risk assessment training for healthcare professionals is available from the QPR Institute in a course entitled: QPRT Suicide Risk Assessment and Risk Management Training. Modularized in a rich mix of text, video, voice-over PowerPoint™ lectures, interactive practice sessions, and other state-of-the-art e-learning technologies, the QPR Suicide Triage Certificate requires completing all online modules and passing a final exam. If the learner passes this national exam he or she will have demonstrated more knowledge about suicide and its prevention than a large majority of mental health professionals. Additional classroom and support training is recommended. If you have not yet completed basic QPR training, it is recommended, but not required, that you complete it before taking this course. By completing this training volunteers, students, and paid professionals are awareded QPR Suicide Triage Certificate. Large employers may inquire about discounted unlimited use licenses (3 year minimum contract is required).